Fire Prevention Week runs the first full week in October. FPW is October 5-9, 2015. Here are fire safety printables and emergency preparedness lessons for Fire Prevention Week. Use free printablefire prevention activities, worksheets, coloring pages, stickers, games, puzzles and crafts to help kids learn vital life-saving skills. Here are free printable family activities for Fire Prevention Week. Across the country, fire fighters, public safety officers, schools, communities and families will be teaching kids about safety this October, just in time for the holiday season. National Fire Prevention is an organization dedicated to teaching people about fire safety and fire prevention. 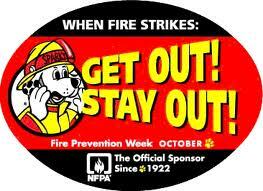 This link takes you to the Fire Prevention Week page. Look for free printable emergency escape plans, home maps, charts, phone numbers lists, safety check-lists and other fire prevention resources. Activities are printed in English and Spanish. Check your local community fire station for details on events they may be hosting. Sparky the Fire Dog has his own website kids can play on. Print a Sparky origami dog. Play interactive games with Sparky, while learning important science lessons. Kids can learn fire safety in a safe non-threatening, hands-on activities. They'll love the fire role play games and simulations.